Nick Loeb’s polarizing, pro-life “Roe v. Wade” movie faced an onslaught of challenges practically from the get-go. Cast and crew members dropped out early in production, reportedly because of the film’s anti-abortion slant. A pair of Louisiana universities barred them from filming on their campuses. Controversial castings of right-wing pundits such as Stacey Dash and Tomi Lahren garnered negative attention. The movie, which Loeb is producing and co-directing, is billed as a fact-based depiction of the true story of the 1973 Roe vs. Wade Supreme Court case that ensured women the right to get an abortion. The film features a number of prominent conservative stars, with Jon Voight and Robert Davi among the cast’s biggest names. Loeb confirms several actors have left so far, but he says they’ve only been low-level cast members. Among those who exited, he said, is the actress originally slated to play Norma McCorvey, the plaintiff identified as Jane Roe in the case. Loeb says the actors who dropped out of “Roe v. Wade” had read the script before they joined, and that it’s “disingenuous” for anyone to suggest they were unfamiliar with the subject matter once production began. He’s not sure if the crew members had read the script beforehand, however, since that would be up to their department heads. Last week, anonymous crew members who had left the project claimed in a Daily Beast report that people were appalled by the contents of the script — which allegedly included graphic depictions of abortions — once they got to set, and that Loeb and his co-director Cathy Allyn were in over their heads. Loeb and Allyn took over as co-directors after the movie’s original director backed out. Two other conservative actors, Kevin Sorbo and Stephen Baldwin, backed out of the project after seeing the script, according to the Daily Beast, but Sorbo says he actually left the movie for a different reason. Baldwin, meanwhile, had no comment on the situation and declined an interview. The Daily Beast also reported that controversial right-wing media personality Milo Yiannopolous had been cast for a cameo as an abortion doctor, though Loeb said he could not confirm or deny his involvement. Voight, who has already filmed his part in the movie, told The News he decided to join “Roe v. Wade” because he wanted to show the history of a controversial subject he believes many don’t know much about. The 79-year-old actor had not seen a cut of the movie when he was reached by The News. This isn’t the first the first time Loeb has been at the center of controversy. He’s often made headlines in the past for his drawn-out legal battle with his former fiancée Sofia Vergara over control of the embryos they froze during their relationship. Joe Leydon, a longtime film critic for Variety and a cinema studies professor at the University of Houston, says many faith-based movies featuring conservative values have been well-received in the past, but he believes the so-called “stunt-casting” of polarizing figures such as Lahren, Dash and reportedly Yiannopolous in “Roe v. Wade” has drawn the wrong type of attention. 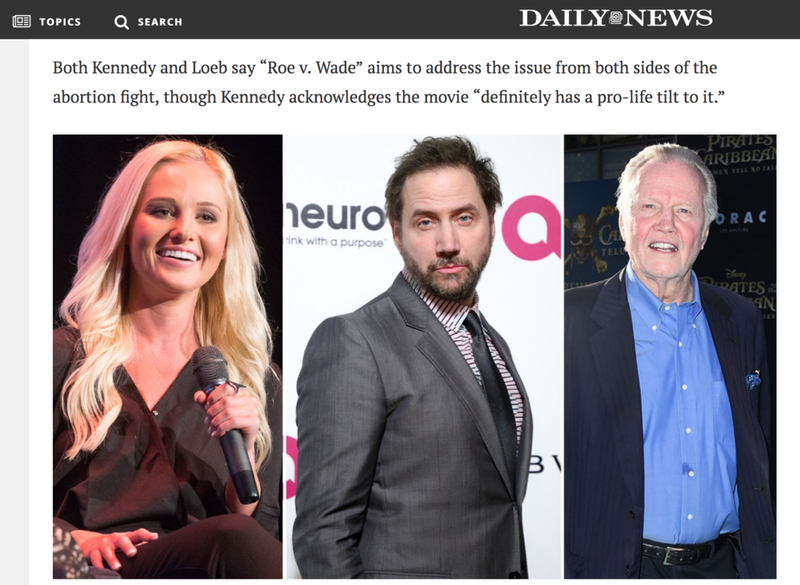 Kennedy, who plays abortion-rights activist Larry Lader in the film, claims the movie’s cast features people who fall on both sides of the political aisle. He was pro-choice when he entered the project but says he now feels conflicted. The actor, 48, admits there is graphic material in the movie, but he declined to detail it. Loeb, meanwhile, acknowledges that a scene they filmed recently could be perceived as graphic, but he doesn’t look at the film as a whole that way.